EVEN MORE WALMART ! HOW CAN THERE POSSIBLY BE THIS MANY HOT FASHION-CONSCIOUS DRESSERS in the U.S.A???!!!?! 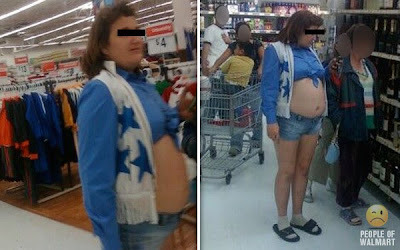 Just when you thought it was safe to go back into Wal-Mart... Enjoy! Yep, you nailed it. - V.I.P. Its like a permanent lumbar support system. By the way, how do you even get hair to cling/mold/bind/form/shape into that? Im just asking so that I dont accidentally do it. Much to my, and Im sure everyone else's, surprise we have a challenger to the Old lady from 8 Crazy Nights look alike. Also, full disclosure I'm a little frightened. I have a feeling her kids are always on their best behavior. I guess thats what happens when you have a professional spanker for a mother. Dont you hate it when you confuse your washing machine and your kids Spiral Splatter Creations Kit? I know I do. OH SNAP! Thats how Willy the Pimp does black and white son! You fake pimps better come correct next time you wanna challenge the legend. Ohhh, if only your parents were given that advice.